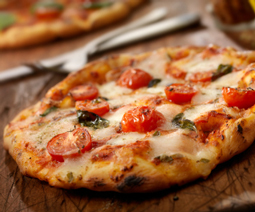 Pizza Dough - A recipe from Savor California, the online showcase for extraordinary gourmet foods and beverages from California. Place pizza stone in cool oven/BBQ to preheat. The stone will crack otherwise. Add all ingredients to a large bowl and knead dough for 7-8 minutes, sprinkling in additional flour as necessary. Turn dough out onto a floured surface and knead again for a few minutes. For individual adult-size pizzas, divide into 5 portions and form into balls. For larger pizza's, divide into fewer portions. Drizzle tray/dough box with olive oil and spread evenly. Sprinkle top of dough balls with olive oil. Cover and leave to rest for at least 20 minutes. Set oven to highest temperature possible. Or 600-700 for BBQ. Slide pizza, parchment paper and all, onto preheated stone. It will take 5-15 min to cook dependent upon temperature (and how often you open the oven/BBQ to check on it).